There’s something to be said about having skin in the game. My skin was clutching the rail as fifty mile an hour winds knocked me around on the pier. Lake Huron doesn’t have the glitzy attraction of Lake Michigan. Bootleggers from Canada sneaked across during the Prohibition era. Lake Michigan draws the Chicago tycoons and celebrities. Lake Huron, as with Lake Superior, is for the pure at heart. Steve Jobs was said to cry when he saw something of spectacularly pure design. 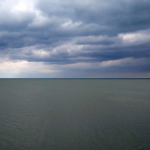 I didn’t feel like crying as I hung out over the rail to take a picture of the Lake Huron horizon. But I reserved the right to cry. Another strong gust of wind and I would have cried man overboard. Gray skies, brown landscape, a mix of cold rain and snow flurries were on my horizon before I raised the camera for a picture. I saw the raw landscape in my windshield for the two hour drive. Some bison with a mouthful of hay stared dumbly at me when I stopped to take a picture. I was trespassing only slightly to get the shot. A big fence blocked a good shot. A man on a tractor came around the barn and I had to get out of there before he saw me, confident that the bison would keep a secret. I didn’t get the picture but I know where the bison live and I will be back for a good pic of the bison farm. At one time I would have preferred to focus only on the beauty of the perfect sunset, skylines over the big cities, and other postcard views that circulate on Google. These photographs are amazing. But everyone has a story, and there’s a good story in every picture. A friend out here, recently married, learned that she has a very serious illness. “We’ll beat it,” she said. She’s tough as her environment. She isn’t one of the drama queens who whines about every little ailment and creates a soap opera out of everything. The kind of person who tells you that they are dying of this or that for the tenth time and you interrupt them by asking to pass the ketchup. I know a woman in an urban area with a very pleasant personality, considering where she lives. She also has friends who are probably the most vulgar, foul mouth people that you could ever know outside of prison. Most of her friends and family have been in prison or currently locked up. She’s rather well spoken when not around these people. She’s cheerful, even though she’s had a hard life. She admits to suffering from ulcers. When her bad friends show up, she begins to mimic their language and all the f word variations. Her poisonous friends have crippled her horizon, like so many. The limited horizon doesn’t just apply to people living in the big cities. A former librarian at the resort town of Ludington, Michigan was in the news this week for a nasty self-published book she had written while working at the library. Her book the “Library Diaries” was based in the fictional town of “Denialville.” She makes it obvious that Ludington is her target. A picture of the town library is on the book cover. In a bitter librarian tells all, she doesn’t hide anything. Ludington has a beautiful horizon overlooking Lake Michigan. She ignores the beauty and focuses in on her own hate. “Open this book and you’ll meet the naked patron, the greedy, unenlightened patrons, destination hell, the masturbator, horny old men, Mr. Three Hats, and a menagerie of other characters you never dreamt were housed at your public library.” She was fired and filed for bankruptcy. The reviews on Goodreads have to be the most negative of anything ever reviewed on that site. The librarian’s bitterness and self-hate made her see the worst in everything and everyone around her. She never learned in an environment with all the books and the Great Lake at her door to just look up. The group is viewed as a positive force. If the group includes a bitter librarian, drama queens, and the criminal element, your circle of friends becomes a noose. I thought Google made a mistake with the label of circles for its new Google plus. The name should have been rivers for life affirming flow of information The purest information designer, the kind that would make a Steve Jobs cry, is found in nature. That’s why the great nature pics are so popular on Google, washing away the drama queens and bitter librarians for something better.